The Library at PS 84 boasts a constantly growing collection of 6000+ books. 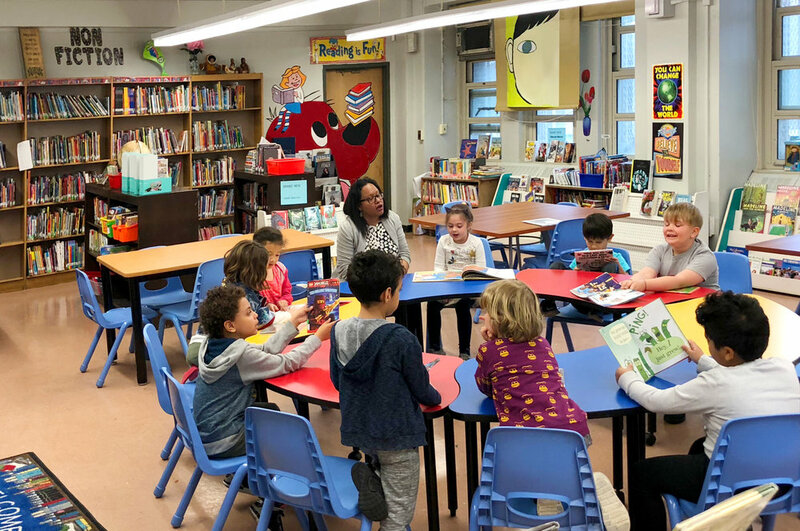 With a dedicated librarian and the help of volunteer parents during student visiting hours, more than 3,000 books are checked out every year by PS 84 students. periodicals, old favorites, and new books that are destined to entice all students to read. Every November, the school organizes a Book Fair. It is a wonderful event for students and family members to shop for books together and also support the PS 84 Library. For more information on volunteering or author visits, or if you have a great idea to share, please contact Ms. Pecoraro at pecoraro84k@gmail.com. A life-long Williamsburg resident, Felicia Pecoraro is a veteran teacher of PS 84 and has been in the library since 2016. She has been a much-needed breath of fresh of air and her love of reading is contagious to all students and visitors. Her 25+ years experience and dedication to our community have made the Library a hub at PS 84. Ms. Pecoraro strongly believes that just one book can help instill the love of books and reading within a child!